Established in 2007, Christmas Near The Beach began as “Christmas On The Beach.” Several years of great success brought about the need for a bigger venue. The City of Hollywood’s Arts Park at Young Circle was the obvious choice. Our name had to switch to match the new location. Founders Mickey and Deena McDaniel selected the simple solution, NEAR! “In 2007, my husband came to me and asked me to put together a Christmas Party for Hollywood and surrounding cities. In 6 weeks, the show was literally thrown together. The hastily produced show was well received by the community. We’ve grown from a few hundred to over six thousand in our audiences.” -Deena McDaniel, EOJ Productions Producer/Director. Every year the stage floods with local talent! Artists donate their gifts blessing South Florida! AND every year St. Nick’s arrival is a highlight of Christmas Near The Beach. “I get to meet and speak with hundreds and hundreds of kids and entire families. It is super cool to sit in my beach house too!” -St. Nick (Paul Derry from Orlando) Keeping in with the South Florida theme, children watch St. Nick arrive on a classic red car with a surfboard led in by a rousing marching band! 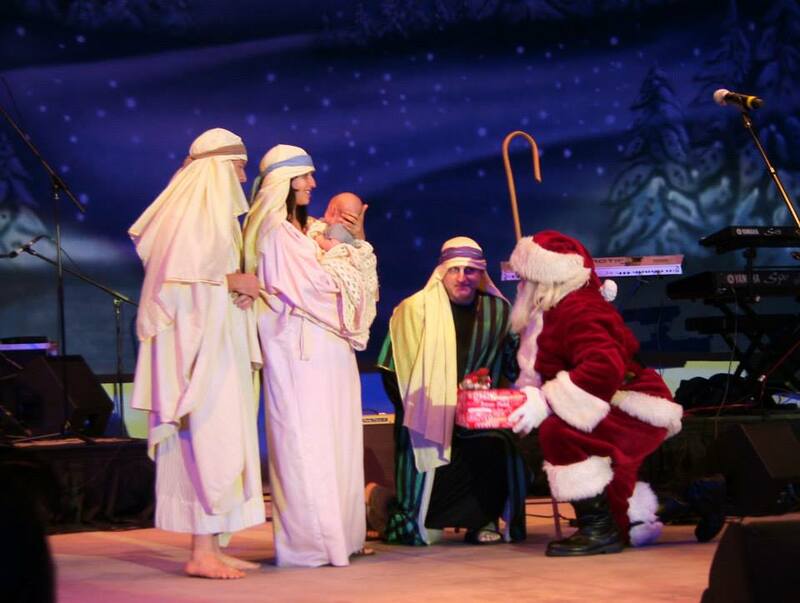 He then takes the stage to visit the live Nativity scene, where he honors the wiggly energetic and sometimes not so silent, “Baby Jesus,” presenting him with the very first gift. Off then to “St. Nick’s Beach House.” Kids take a quick tour through St. Nick’s Florida living room, and end up at his ROCKIN’ Sleigh for a free photo and chat with the jolly ole guy himself. Throughout the night the stage displays the most amazing talent. There are bands, dancers and even a rollerblading Grinchy! Traditions continue as each year our CNTB Flash Mob Dancers grow in number! “Christmas On The Beachside,” an original song written and performed by Nashville recording artist Austin Adamec has brought the crowd to its feet every year. Each year our all volunteer team expands and we continue to reach out to area business and organizations who team up with us. Sponsorship is available through our Partner page. Please consider giving back to the South Florida community. Contact Deena McDaniel at deena@christmasnearthebeach.com or call direct to 573-280-8486.